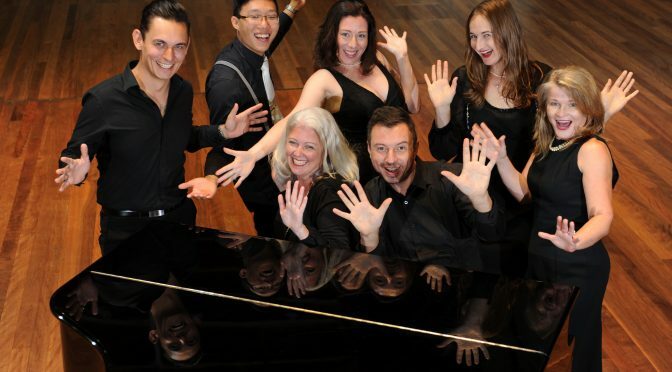 For their current show Mosman Musical Society celebrates classic old songs, jazz standards and cabaret numbers, The production is set in a beautiful converted old church which provided a wonderful atmosphere along with very fine acoustics. In true cabaret style the audience enjoyed the show from candle-lit seating with cheese platters and champagne on offer. The show featured a large cast of singers and dancers well directed by Nicola Wilson with expert choreography by Lisa Frisina. The cast were decked out in black with the females wearing plenty of pearls and bling. Their appearance evoked a sense of subtle, alluring style as they seduced the audience with their vibrancy, talent and expertise. The staging varied from solo performances to duets and small groups to large company numbers.There was a flashy, unpredictable manner in which the performers would appear – often flying in from the wings – through the open old church doors. As a result of the large cast numbers, some of the singers stood in clusters around candlelit tables beside the stage, harmonising beautifully with the current vocalist. Each rendition received a warm reception from a very appreciative audience. The show featured two sets, running for two hours with a brief interval. Every number held its own in style of presentation and entertainment value. Here are some of my favourites. Simon, wearing a white shirt, black bow tie, black waistcoat and black pants, singing Come Fly With Me very cooly as he sashayed around the audience. Albert, Phil, Luke, Susan, Jill, Emma, Amanda, Matt, Dominic, Jody and Patric combined together to perform an exciting, up-tempo version of Sway which the audience loved. Patric and Ronni performed a very cute version of Baby It’s Cold Outside with the performers amorously embracing at the end of the song after feigning a romantic interlude off stage. Emma started her rendition of the gentle ballad Every Time We Say Goodbye a little shakily but then she gained mastery of her nerves and her voice became strong and heartfelt, winning the audience over. There was plenty of colour with It Don’t Mean A Thing If It Ain’t Got That Swing. Matt, Angela, Chloe. Emma, Jacqui, Jill and Pam wore colourful outfits with a polka dots and white sneakers, dancing exuberantly. Jill, Pam and Jacqui performed a very up-tempo version of Get Happy which definitely put one in the party mood. There were two lovely a cappella versions of standards; Susan, Nicola, Alex and Amanda singing a sultry version of Summertime and Ronnie and the Ensemble performing a poignant version of SomeoneTo Watch Over Me. Nicola’s intimate version of When I Fall In Love drew a lot of applause. The night finished with a lovely rendition of the title song, Fly Me To The Moon featuring the Ensemble. We were then treated to one very memorable encore. All the dancers deserve mention – Angela O’Reilly, Debbie Wilt, Emma Frisina, Erin Penhaligon, Jenna O’Donnell, Michelle Barron, Melanie De Col, John Frisinam, Lisa Frisani. Through the show the performers were backed by a very fine five piece band under the musical stewardship of pianist, Emily-Rose Sarkova. I couldn’t speak highly enough of the band; Sarkova’s fine playing, Robert Cantwell blazing away on sax, clarinet and flute, Jacques Pierre Emery on double bass, Heather Prowse on trumpet and Peter Longhurst on drums. After all the excitement of FLY ME TO THE MOON it took hours to come back down to earth. 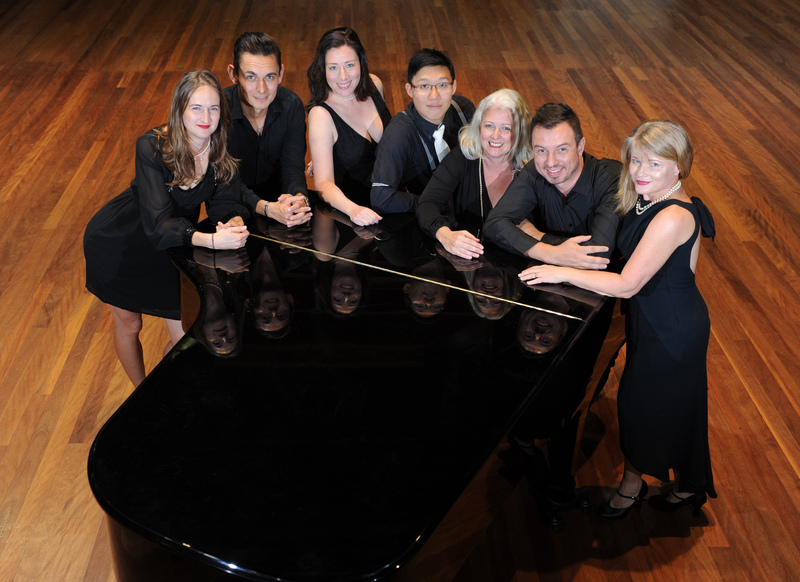 Highly recommended, FLY ME TO THE MOON , Mosman Musical Society [Facebook] is playing Mosman Art Gallery again tonight at 8pm, there is a matinee tomorrow at 2pm and then an evening performance at 8pm and then the final performance is Sunday 25th March at 3pm. The performances are selling fast.